Betty’s Strip Hair products are wonderful grooming tools. They are super easy to use, painless for your four-legged companion, easy to clean, and so much more. 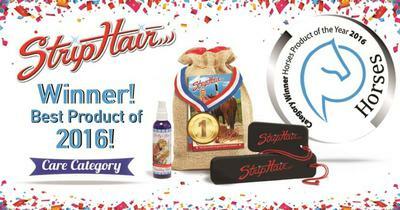 I have tried them on my own horse and was super impressed with how well each product included in the kit worked. 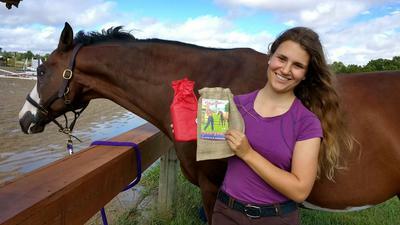 The kit they gave me to try was cutely packaged and will make a great horse lover gift for any occasion. These are the two main tools included in the kit. They can be used for de-shedding, getting mud and dirt off, buffing hooves, or just overall grooming to create extra shine and keep your horse’s coat healthy. The smaller one is particularly handy as it can be used on the face and legs painlessly, which is really nice since there are not many effective grooming products on the market that I feel safe using on my horse’s face and legs. They are flexible and easy to clean; all you have to do is wipe them off with a cloth. You can even use them when bathing your horse. They are incredibly versatile. This stuff smells amazing. It had to be one of the few great smelling, yet effective skin sprays out there. I have only been using it for a few days on my horse’s dry skin patches but they are already doing so much better. This skin spray has a ton of different applications though.mIt can be used to just pull extra dust off; to treat itchy skin, bug bites, skin scald, cannon bone build-up, fungal issues, or bacterial issues; repel flying insects, or repel fleas and ticks from pets and bedding. These grooming cloths are the perfect tool to use at the end of your grooming regiment. They easily pick up any dust or dirt left over from the initial grooming. I have found that it works by either spraying some of the skin spray on the cloth then running it over my horse's skin or just by getting it wet, ringing it out and running it over my horse's body. They are also easy to clean. All you have to do is dunk them in the water, ring them out, and let them dry. They will be releasing new products soon so make sure you stay tuned and be sure to check out my unboxing video of these products (coming soon). What do you think of this grooming kit? How would it help you groom your horse? Share your thoughts in the comments below. When it rains here more than it doesn’t, the horses like to roll in it and get muddy and I don’t mind it, heck I would do it also if I didn’t have to wash out the mud stains 😂 but it would definitely make it easier and a lot more gentle on their skin, with this Grooming Kit!